Christopher Fitzgerald’s pants. 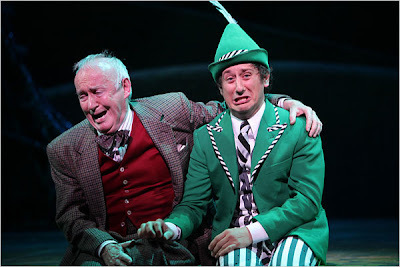 Playing the loveable leprechaun Og who has traveled to Missitucky, USA from Ireland in search of his stolen pot o’ gold, Fitzgerald cements himself as one of Broadway’s greatest current character actors. Having played quirky and riotous characters in Wicked and Young Frankenstein before this, his performance in Finian’s is delightful. A mute performance by Fitzgerald would be equally as entertaining, because the man’s eyes and mouth work to create such animated facial expressions, he can convey almost anything and make it just as enjoyable. While he’s staying in Missitucky, away from his magical homeland, the leprechaun finds that he is growing. Costume designer Toni-Leslie James puts Fitzgerald in different sets of pants throughout the show, each new pair shorter than the last. This simple, not-fooling-anybody gimmick becomes so hysterical, and Fitzgerald wears the joke perfectly. Kate Baldwin: The Breakout / Cheyenne Jackson: Broadway’s new A List. As Finian’s lead lovers, Kate Baldwin and Cheyenne Jackson show true star power on the stage. As Sharon, Baldwin makes her first Broadway leading role monstrously impressive. Given gorgeous numbers like “How Are Things In Glocca Morra” and “Look To The Rainbow,” Baldwin shines with unmatched grace. Her voice is clear and rolls through the ballads with pleasant vocal nuances and a soft hint of Irish accent. For someone who has understudied for Broadway leads for years, this is a well-deserved and elegant debut. Her handsome counterpart, Woody, is played by Jackson, who has quickly become a part of Broadway’s A list. I was surprised to find the role of Woody didn’t allow Jackson to showcase much at all, which is disappointing for someone of his talent. But he took a fitting role in a great show, and that says something to his artistic taste. With guest spots on 30 Rock and his increasing desirability on the stage, getting to see Jackson live in anything is an opportunity to be taken. A racist, white senator turns black. Yep, you read that right. How could anyone not be interested in this kooky show about a mythical town of Missitucky sharecroppers who are in the midst of being thrown off their land by a windbag senator? So that he may see the error in his backward thinking, Senator Rawkins (initially played by David Schramm) is magically transformed into a black man (played by a booming, strong Chuck Cooper). It’s weird, but it gets a lot of laughs, and anyone can admit—it’s unlike anything they’ve seen on Broadway before. Actress Terri White used to be homeless. It’s hard to imagine that a supporting lead actress in a Broadway show could have been homeless only a year ago, but such is the case for Terri White, who plays Dotti. After years of professional acting, she was unable to find work and fell upon dire economic times, lost her apartment, and began sleeping in Washington Square Park. But magic has sometimes been known to happen in New York City, so she landed this role in Finian’s and was featured in People magazine. During the curtain call, you can tell that White is grateful to be where she is, and it’s touching. Baldwin isn’t the only one for whom this show has been a big break, which makes it even more disappointing that it is closing so soon. 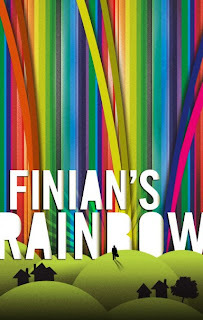 While the story is definitely light and at times verges on bizarre, Finian’s Rainbow has gorgeous musical numbers and a cast that can charm the pants right off anyone (or shorten them, in Fitzgerald’s case). Most importantly, it’s an amazing display of some of Broadway’s hottest new talent on the same stage, and that is reason enough to catch this before it’s gone.